I’ve made gnocchi ever since I can remember. As kids, we used to make all different shapes and textures. At home, we usually had gnocchi on Sunday when there was time to make enough for a large family gathering. I still pass on this wonderful tradition to my grandchildren. Although they are now teenagers, the kids were helping me to cut the dough and shape the gnocchi with a fork since they were toddlers. It is a tradition, that I hope that they will pass on to their own families. Boil the potatoes in their skins about 40 minutes, until easily pierced with a skewer. When cool enough to handle, peel and rice the potatoes, and set them aside to cool completely, spreading them loosely to expose as much surface as possible to air. (The reason for this is to allow as much evaporation of moisture as possible to avoid the need of additional flour, therefore keeping the gnocchi light). Before proceeding further, bring 6 quarts of water and 2 tbs. of the salt to a boil. On a cool, preferably marble work surface, gather the cold riced potatoes into a mound, forming a well in the center. Stir the remaining 1 tsp. salt and the white pepper into the beaten eggs and pour the mixture into the well. Work the potatoes and eggs together with both hands, gradually adding 3 cups of the flour and scraping the dough up from the work surface with a knife as often as necessary. (Incorporation of the ingredients should take no longer than 10 minutes. The longer the dough is worked, the more flour it will require and the heavier it will become). Dust the dough, your hands, and the work surface lightly with flour and cut the dough into six equal parts. Continue to dust dough, hands, and surface as long as the dough feel sticky. Using both hands, roll each piece of dough into a rope ½” thick, then slice the ropes at ½” intervals. Indent each dumpling with a thumb, or use the tines of a fork to produce a ribbed effect. (This facilitates adhesion of the sauce). 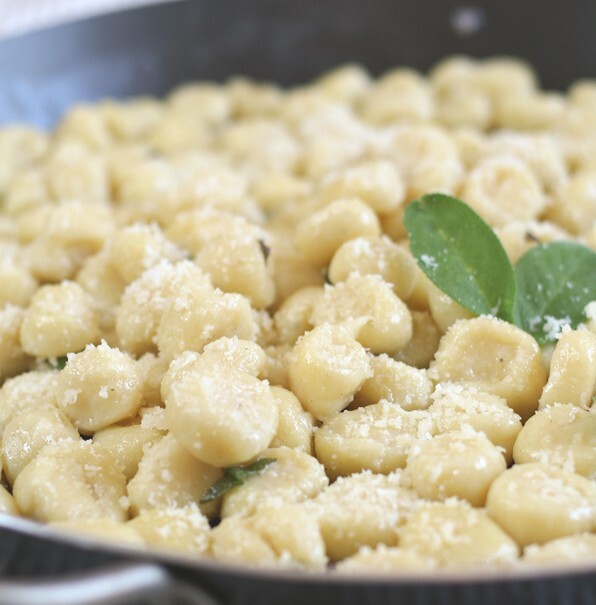 Drop the gnocchi into boiling water a few at a time, stirring gently and continuously with a wooden spoon, and cook for 2-3 minutes, until they rise to the surface. Remove the gnocchi from the water with a slotted spoon or skimmer, transfer them to a warm platter, adding a little sauce of choice, and boil the remaining piece in batches until all are done. Sauce as desired, add freshly ground white pepper to taste and, if appropriate, grated cheese, and serve immediately. La Cucina di Lidia, Doubleday, 1990.